What’s life like inside a fashionable apartment building in New York City? Even if you’ve never asked yourself that question, this engagingly eccentric collection of stories will make you want to politely ask a doorman to let you in so that you can spend a few hours getting to know the building’s residents. Chris Raschka brings us into a grand old apartment building at 777 Garden Avenue, planted squarely on Manhattan's Upper East Side. The charmingly quirky collection of ten stories introduces us first to the new doorman, Mr. Bunchley. Unlike the recently retired doorman, Mr. Bunchley cannot chat with the residents about their favorite topic: baseball. When Miss Victoria says she adores Mickey Mantle, he wonders if Mickey is a classmate. When Mr. Sherman asks what Mr. Bunchley thinks the Yankees’ chances are, he asks, “Chances at what, sir?” Sigh. Even after the building manager instructs Mr. Bunchley to get with the program or to get out, the doorman just can’t seem to comprehend baseball. Instead, Mr. Bunchley establishes himself as an expert botanist, able to grow any flower that can fit into a pot. He fills the lobby with beautiful blooms, and the residents are ultimately enchanted and accept the doorman for who he is. We next meet Fred, a somewhat scruffy man of indeterminate age, telling the boy Theo that gravity is too strong (or weak) on any given day, and that it’s related to the city’s pigeons. Apartment residents complain about Fred feeding the pigeons, fearing it will decrease their property values. “Pigeons are what keep these buildings from falling down all around us,” he explains. Everyone scoffs! The years go by, gravity holds steady, Theo grows up, and Fred continues to feed the birds. When Fred dies an old man, thousands of pigeons gather around 777 Garden Avenue, seemingly to mourn his passing. In three days, they disappear in a swirl of feathers, and a small earthquake rumbles through the apartment building, proving that gravity is indeed, unbalanced by their absence. The apartment’s opera singer—a requirement for all New York City apartments—belts out an errant high E that goes astray and strikes an innocent passerby. A long-forgotten room filled with a special treasure that was once sealed up during an apartment remodel is rediscovered. A temperamental boiler cannot be depended upon to maintain the correct temperature in the building. The resident mice enjoy time-shares and jazz. A matchmaking elevator with romantic feelings sets up a couple in a unique way. Raschka, a Caldecott Medal winner, illustrates the stories, which effortlessly slide backward and forward in time, in his signature swirling impressionistic style. Despite the talking rodents and emotional machinery, some may question whether this is really a children’s book. The rich vocabulary, humor, and intriguing characters make it a book for all ages. Adults may prefer to read this book aloud to younger children, if only to help them understand the intricacies of the stories. 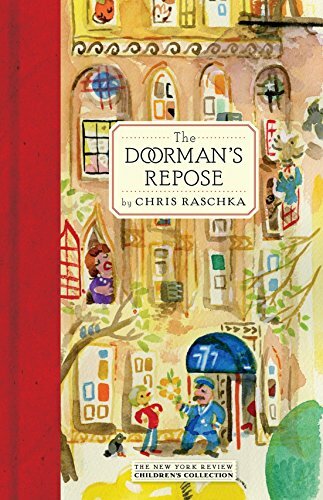 The Doorman’s Repose is a delightful and moving book written with warmth and lively imagination that parents, teachers, librarians, and children are sure to appreciate. Its colorful cover and small size make it a lovely book to hold or to stow in a backpack.